Unsurprisingly, most people take the presence of their teeth for granted. It isn’t until we lose a tooth through decay or damage, or are told that we require an extraction, that we suddenly start to worry about how we are going to manage with a gap in our smile. A missing tooth has two main effects. One of the first things that you will probably think about is how your smile is going to look. There is a greater emphasis on appearance than ever before, and a great smile is a highly desirable feature. Unfortunately, if you have a missing tooth, the attractiveness of your smile is going to be affected. This can cause feelings of low confidence and self-esteem, embarrassment and even shame. Some patients with untreated gaps in their smile become withdrawn and unsociable, and this often leads to isolation and depression. The other main effect will of course be on your ability to use your teeth properly. The extent to which you are affected will depend on how many teeth are missing and where in your mouth these gaps are. For example, a missing molar may not cause too many issues since it is at the back of your mouth and you have plenty of others to chew your food. However, a missing incisor is much more noticeable and may affect your ability to bite, and even speak since the tongue needs to press against teeth to help us form sounds. Thankfully, there is no need to live with the effects of tooth loss. There are several different types of solution now available that can replace the missing tooth with a prosthetic, restoring the look and function of your teeth once more. In the past, patients had the choice of a dental bridge (to replace single missing teeth) and full or partial dentures (for multiple gaps in their smile). However, today there is one solution that is considered superior and more desirable than any other – dental implants. Dental implants are a unique and highly effective tooth loss solution that is flexible enough to be used to replace single or multiple missing teeth. The key element of their design is a titanium post, which is inserted into the jaw bone via an incision in the gums. The post is placed using cutting edge technology to determine the location of the dental implant. Once inserted, the live gum and bone grow around the post, anchoring it permanently and securely to your jaw so that it forms the root of your prosthetic tooth. Then, a custom-designed dental crown is attached to the protruding section of the implant post. This forms the artificial tooth that you can see when you smile. When single teeth are being replaced, a single implant post is used per prosthetic tooth. 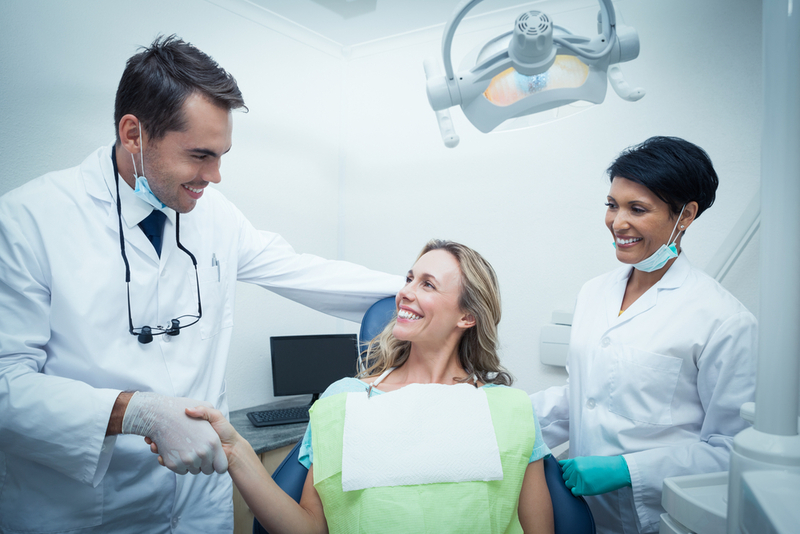 However, if you have multiple teeth that have fallen out or require extraction, you may be a candidate for a bridge or dentures that are supported on implant posts. What makes dental implants best for tooth replacement? When you lose teeth, your face can start to look sunken and strange. However, dental implants can help to preserve and maintain your facial structure by encouraging new bone growth in your jaw. This will help to keep your jaw prominent and enable you to look more youthful. One of the biggest problems with bridges and dentures is that they are both fairly fragile. Dentures must be removed to be cleaned, and if they are dropped they will become damaged or even break entirely. Dental bridges also have an approximate lifespan of just 10-15 years. Regular maintenance visits are needed for both. However, the condition of your dental implant can be assessed at your usual 6-monthly oral health check-ups, and reports of damage to implants are few and far between. With the right care and attention, your implant could last you upwards of two decades. Dental bridges fill the gap you have with a prosthetic tooth, but the device is actually supported on healthy teeth on either side of the space. These are known as abutment teeth. The trouble is that, over time, the stress placed onto these teeth can become excessive and it is not unheard of for the device to cause damage or even dislodging of abutment teeth. Since dental implants don’t rely on any neighboring teeth for support, they are a better option for protecting the remainder of your smile. As a permanent solution that quickly becomes so comfortable, you forget that they aren’t your natural teeth, dental implants are much more discreet than dentures or bridges. You don’t have to worry about them slipping or falling out when you cough or sneeze, and you can eat pretty much anything your heart desires without worrying about them pulling out. They are created with the latest technology, meaning that your implant will be a perfect fit for your gap, and will look and feel just like your natural teeth. If you have lost a tooth already and have a gap or a prosthetic that you aren’t entirely happy with, or if you have a planned extraction coming up, contact and speak to our dental team about dental implant surgery – the most secure, comfortable and attractive tooth replacement option currently on the market.